Mobile analytics firm App Annie today launched Usage Intelligence, a new tool to help developers track active users, time spent on the app, usage frequency and more. The announcement comes alongside the company’s Series D financing, having raised $55 million in its latest round. It also said its active user base grew by 75 year-to-year in 2014, particularly after its acquisition of analytics firm Distimo last May. App Annie customers can find the new usage information right below the Intelligence tab, with data on how users are accessing an app, average session times, total usage time across various time frames and the countries in which the app are being used. In better understanding how often users are engaging with their apps, developers can gain insight on how to retain users and how app updates affect usage times. 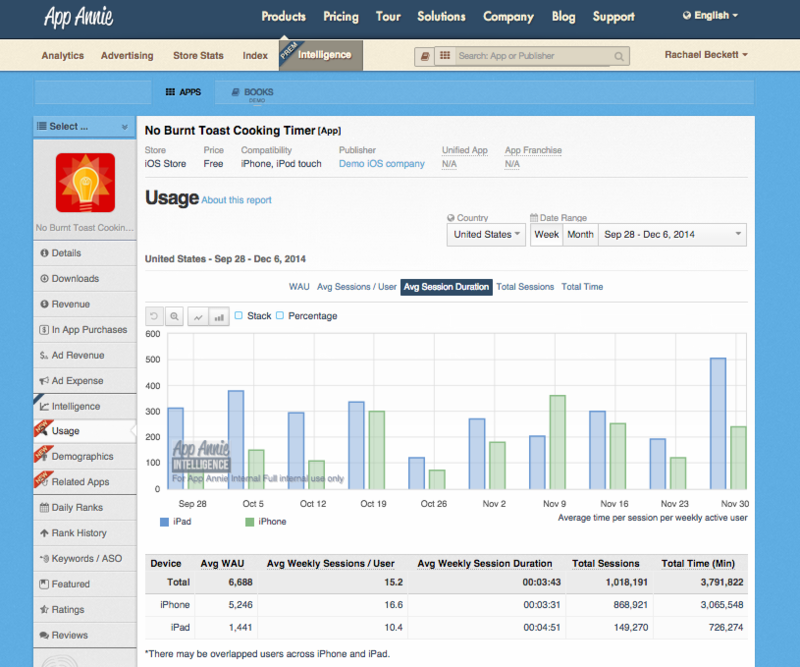 With the recently added Audience Intelligence – a tool that offers developers insights on user metrics such as age, location, income and gender – App Annie’s premium analytics product now provides intel on how often users engage on an app, who these users are and information about the app’s competitors.